People have always had a bit of a morbid obsession with the zombie apocalypse. We’ve had a pretty steady stream of zombie flicks on our screens for four decades, dating right back to Romero’s influential masterpiece Night Of The Living Dead in ’68. Only a few years ago the zombie craze was so strong that it felt like every second movie was a zombie one, with each trying to tackle our infatuations from a different angle. So naturally, one would be forgiven for thinking this genre has nothing new to offer – but one would be wrong. Here we are yet again with another fresh and sparky take on the moaning, shuffling corpses that really does feel unique, and bears a stark resemblance to the ingenuity of 2009’s brilliant Zombieland. From writer and director Johnathan Levine, whose best-known work to date is the Joseph Gordon-Levitt and Seth Rogen-starring comedy drama 50/50, Warm Bodies follows R (Nicholas Hoult), a zombie who’s different to all the rest: he can think. Sure he still shuffles around aimlessly day by day, groaning and eating brains, but when his horde bumps into a group of survivors out on a supply run, he instantly falls for Julie (Teresa Palmer) and saves her from being eaten by his comrades. As he grows to know her, and she him, his heart begins to warm. A wacky premise for sure, but undeniably unique. It takes about twenty minutes to get used to the angle it’s going for. I’m quite a stickler when it comes to ‘proper’ zombies, in that I often feel inclined to like a film less if the zombies run (28 Days Later aside – they’re not zombies) or show signs of human abilities like coordination or reason. At first I wasn’t quite on board with the fact that R could think and ‘communicate’ with other zombies, but gradually I grew to accept it as I melted into the story, and more so as I landed on the realization that I was watching a comedy and should stop being such a pretentious pedant. If you don’t have these issues to begin with you’ll probably have a great time from the very opening sequence. In all honesty I wasn’t overly keen on Hoult up until now, but he’s great in this. At first glance it might be easy to think he doesn’t actually have much more to do than just shuffle around and every so often grunt, but it’s a performance of the face, and his facial reactions to his narrating thoughts are just priceless. There are also moments when your heart really goes out to him. He’ll next crop up in Jack The Giant Slayer, which I can’t say I’m overly stoked for, but I’ll definitely anticipate his future performances with an open mind. The supporting cast is bulked up with a few names. John Malkovich as the hardened, pessimistic father of Julie and commander of the military resistance, does what he has to do perfectly well but with a character that’s slightly underwritten and given too little attention. 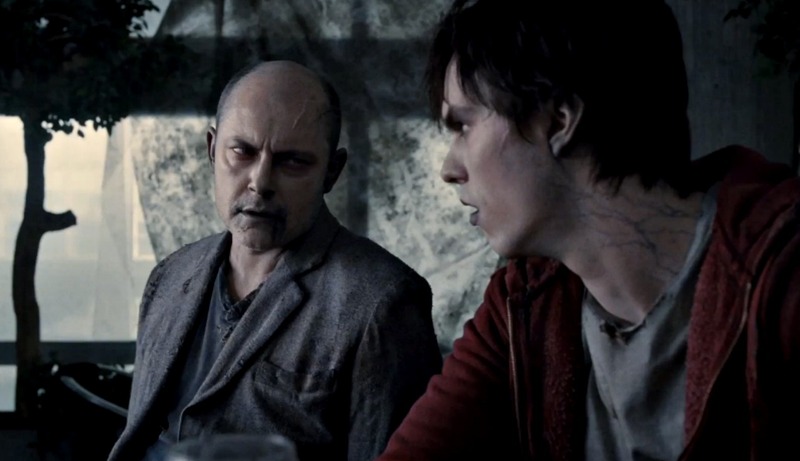 The brilliant Dave Corddry, who plays R’s zombie buddy (above), has some absolutely cracking moments, and Dave Franco, who seems to be cropping up in more movies than his big bro James at the moment, steps in as the third corner of the semi love triangle running through the middle. A sweet, charming little gem that instead of smashing walls quietly breaks boundaries. The love conquers all moral leaves you feeling warm and fuzzy, and while it doesn’t quite match Zombieland on laughs, it definitely matches it on heart. I heard this was very good and since I’m all for feeling ‘warm and fuzzy’ then it’s a definite go.